Tinytag data loggers are monitoring temp/RH during the critical drying phase of brick production. Data loggers record essential environmental information to help identify potential problems in the dryer, to ensure quality levels are maintained. Wienerberger is the world's largest manufacturer of bricks, operating a total of 214 plants in 30 countries. Wienerberger is the second largest brick manufacturer in the UK with a number of factories nationwide. 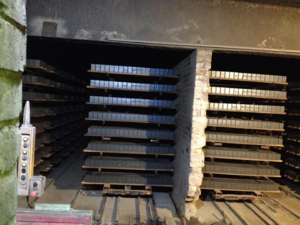 At the company's Denton factory near Manchester, Tinytag temperature and relative humidity loggers are being used to measure any potential anomalies in each of the tracks within the brick dryer, in relation to balance of temperature compared with humidity levels. This is very important as 'dryer dripping' can occur during the process, causing water droplets to make impressions on the bricks, which affects the overall quality of the yield. If dryer dripping occurs, the loggers are placed on a dryer car and sent through the tracks in question. The data helps identify at what point the humidity is high (which usually shows a drop in temperature), pinpointing at what stage this occurs in the dryer. Investigations can then be made to see if there is a problem with a certain fan down the track: if a fan is found to be faulty, the relevant repairs or adjustments can be made to rectify the problem. Production and Maintenance Controller Michael Stewart is responsible for purchasing all critical and consumable spares along with producing performance data analysis systems. Michael comments, "The Tinytags were sourced by our Deputy Works Manager who also manages the Kiln, which directly relates to the dryers as the residual hot air is taken over to them from the Kiln." The image shows the dryer entrance: the gaps that are visible in between the cars are closed off by the first rotational fan and every fan after that down the tracks. Michael adds, "We are very satisfied with the Tinytags as we were able to work out exactly where we were experiencing issues within the dryer. These areas are inaccessible when all the tracks are laden with bricks so it helped us out a great deal."